The United Kingdom is a parliamentary democracy based on universal adult suffrage. It is also a constitutional monarchy. Ministers govern in the name of the sovereign, who is the head of state and government, commander-in-chief of all the armed forces of the Crown and the supreme governor of the established Church of England. The constitution is unwritten, and relies on a combination of statutes, common law and convention. The UK is a union of four countries: England, Scotland, Wales and Northern Ireland. The Crown dependencies (the Channel Islands and the Isle of Man) are largely self-governing with the UK responsible for their defence and international relations. Parliament is bicameral, with an upper chamber, the House of Lords (89 hereditary peers, 678 life peers and 25 bishops in March 2011), and a lower chamber, the House of Commons (650 elected members). Elections to the lower chamber are held every five years. The prime minister and cabinet lead the executive. The prime minister is appointed by the sovereign, and is usually the leader of the party who commands a majority in the House of Commons. The prime minister chooses and appoints the cabinet. The UK Parliament enacts primary legislation, except where these matters have been devolved to the Scottish Parliament and Northern Ireland Assembly. The executive consists of the members of the cabinet, other ministers, government departments, local authorities, public corporations, regulatory bodies and other organisations subject to ministerial control. Devolution changed the responsibilities of the Secretaries of State for Scotland, Wales and Northern Ireland, although they still retain UK Cabinet seats. The judiciary determines common law and interprets statutes. The United Kingdom Supreme Court is the final court of appeal in civil matters for the whole of the UK, and in criminal matters everywhere except Scotland. In England and Wales, the High Court of Justice has three divisions, Chancery, Queen’s Bench and Family, which deal with certain more complex civil cases, while the county courts try the majority of civil cases. The Crown Court has jurisdiction in the most serious criminal cases providing trial by jury. England has had a single crown since the 10th century and a parliament since the 13th century. The constitution evolved as a struggle for power between them. In 1169 Henry II of England authorised an invasion of Ireland, following which a large part of the country came under the control of Anglo-Norman magnates. Wales came under English rule in the 13th-century during the reign of Edward I. In 1603 King James VI of Scotland succeeded to the English throne, thus uniting the two crowns; in 1707 both countries agreed on a single parliament for Great Britain. The modern Conservative party evolved out of the 18th century Tory Party and the Liberal Democrats out of the Whig party. The Labour party, representing working people, emerged at the end of the 19th century. The deep divisions in Northern Irish society, dating from the time of the Irish independence struggle at the beginning of the 20th century, were exposed in an upsurge of violent conflict in the 1970s, which lasted into the 1990s. Many members of the Protestant majority were Unionists who wanted to remain British, while many Roman Catholics were Nationalists or Republicans who favoured unity with the Irish republic. In 1997 the Labour party won their first general election since 1974, and Tony Blair became prime minister. In 2007 he was succeeded as Labour party leader and prime minister by Gordon Brown. In the May 2010 election no party won an overall majority. 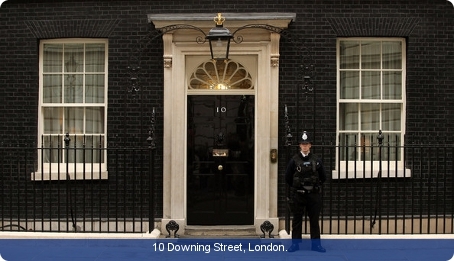 The party with the largest number of seats, David Cameron’s Conservative party, formed a coalition government with Nick Clegg’s Liberal Democrat party; Cameron became prime minister and Clegg became deputy prime minister. It was the country’s first full coalition government for 65 years.